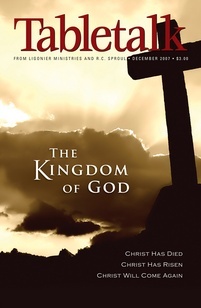 “He said therefore, ‘What is the kingdom of God like? And to what shall I compare it? It is like a grain of mustard seed that a man took and sowed in his garden, and it grew and became a tree, and the birds of the air made nests in its branches’” (Luke 13:18–19). Jacob’s blessings in Genesis 49 are future oriented and give readers an opportunity to think on things yet to come. Eschatology is the theological term for the doctrine of the last things, including the “last things” that Jesus started during His ministry on earth. It will therefore be beneficial for us to look more closely at these things by studying volume eight of Dr. R.C. Sproul’s teaching series Foundations. Heaven and hell are both important aspects of Christian eschatology, but we will not be looking at these subjects in detail because we covered them a few months ago. Instead, we will begin with that which underlies all things past, present, and future — the kingdom of God. The story of Scripture is the story of God’s kingdom. Of course, the Bible everywhere assumes that our Father is sovereign over the universe (Pss. 47:8; 93:1; Rev. 19:6), but this is not the concept the “kingdom of God” has in mind. More precisely, the kingdom of God refers to the visible, universal submission to His reign. As is well known, Adam’s sin plunged mankind into rebellion against its Creator (Gen. 3). Yet the Lord’s prophets predicted a day when all creation would again recognize Yahweh’s authority and bow the knee to the appointed king (Dan. 7:13–14; Micah 4:1–7). Some will fall before Him willingly, others will be forced to do so; on that day, all people will acknowledge God’s reign (Ps. 2; Phil. 2:9–11). The Lord’s chosen king is the Messiah, Jesus. Unfortunately, many Christians incorrectly believe that His kingdom has nothing to do with the present, something that comes only at “the end of time” with great natural disasters. While Jesus’ return may indeed involve these phenomena, His second coming is the consummation of His present reign, for He actually inaugurated the kingdom of God during His first advent (Mark 1:14–15). As today’s passage teaches, it starts out small and is growing to be present in all things (Luke 13:18–21). We Christians are the heralds of this kingdom (Acts 1:6–11). By the power of the Holy Spirit, we bear witness to our King, and through our obedience the Father will call people to worship Him (Matt. 28:18–20). Thus, His kingdom increases in its visibility. When Jesus taught us to pray, He told us to ask for God’s kingdom to come (Matt. 6:9–13). It is easy to pray a laundry list of requests for health, safety, and other provisions. But how many of us spend time in concentrated prayer that all peoples would submit to God and obey His Law? All of us should be praying for at least one person’s salvation. When we seek to be used by God to lead others to the truth, we are obeying, at least in one way, Jesus’ prayer request.